...and we had a fantasic time! It's not often (more like never) that we take a family vacation. The summer is Don's busy time at work and we just don't take the time off. This year, we headed to South Carolina and stayed with some long time friends. Don drove the track at Lowe's Motor Speedway in Charlotte with the Richard Petty Driving Experience. He said it was the "experience of a lifetime"! That was, by far, the best birthday gift I could have gotten him. He is now ready to drive at Richmond! Also, we visited with some other long time friends who are in Charlotte. All three families got together (the guys all grew up together) and we enjoyed each others company and ate some good food. The kids all got along great...just like no time had passed between them. What a fabulous vacation we had!!! Which brings me to my card. Needless to say, I needed a thank you card. The SCS CAS challenge for 6/29/09 was to make it sparkle. 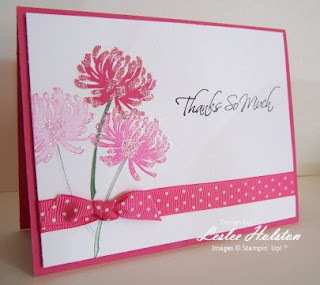 This is a very simple and quick card to make. The flower and sentiment is from the new Hostess Level 3 set called Kind & Caring Thoughts (sorry, for some reason, I can't find to link to that set...you can see it in the catalog though). I inked the flower head in Melon Mambo and the stem in Garden Green using markers. I used the generation stamping technique. That's where you stamp the image repeatatively without reinking the stamp. I did 'huff' on the stamp between each stamping just to remoisten the ink. Each stamping will be slightly lighter than the last. 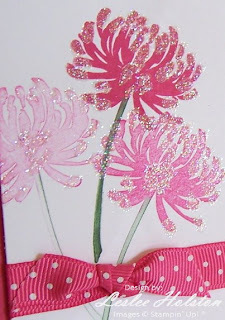 I then used my 2-Way Glue pen on the petal tips to adhere my Dazzling Diamonds Glitter to the image. A length of the new Melon Mambo Polka Dot ribbon was wrapped around the Whisper White card stock and then it was layered onto the Melon Mambo card base using Stampin' Dimensionals. I just wanted a card to convey our appreciation for the warm hospitality we were given. I think this card will do just that. Thanks for stopping in today. I hope you can find some family time in your busy schedule. Now, if I can get all those pictures into a scrapbook....I'll have to work on that soon. Don't forget to check out the DEAL OF THE WEEK! I'll post it when it is up from SU!